THE WORLD’S MOST USEFUL AND ENVIRONMENTALLY FRIENDLY LUBRICANT SINCE 1904. For more than a hundred years, consumers have trusted Ballistol to lubricate, penetrate, clean, protect, and preserve their firearms, leather gear, wood, metal surfaces, and more. With an astonishingly wide range of applications, this environmentally friendly multi-purpose oil has become an essential tool for shooters, hunters, fishermen, and handymen all over the world. THEIR MISSION: DEVELOP AN OIL THAT CAN BE USED ON EVERYTHING. At the turn of the 20th century, the German Imperial Army began looking for a multipurpose oil that could be used to clean and maintain the metallic parts of a rifle, while also protecting its wooden stock and a soldier’s leather gear. To develop this oil, the Army contracted with Friedrich Klever and his son Dr. Helmut Klever, a professor of chemistry at the Technical University of Karlsruhe. THE CAN ISN’T THE ONLY THING THAT’S GREEN. Ballistol cares about our planet, and they are committed to producing an environmentally friendly product. 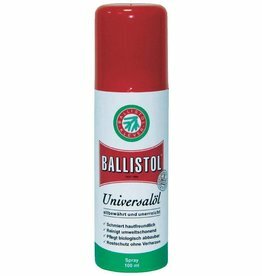 With Ballistol, you will lubricate, penetrate, clean, protect, and preserve your equipment without contaminating the environment. Ballistol is biodegradable, and neither its use nor its disposal will pollute our air or water. Its natural decomposition will not produce byproducts that are harmful to the environment. The aerosol propellant is a propane/butane blend that does not contain CFCs. In addition, Ballistol is non-carcinogenic and skin safe. Wapenolie in sprayvorm, multi-toepasbaar in en rond het huis. Verzorgt, smeert, desinfecteert en beschermt tegen corrosie. Kruipt in de kleinste hoekjes en verhardt niet, zelfs niet na jaren.